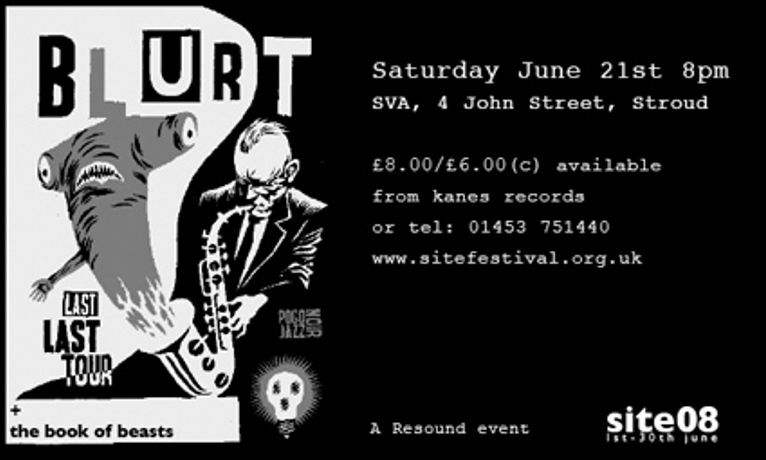 Blurt supported by The Book of Beasts Saturday June 21st 8pm Stroud Valleys Artspace,4 John Street, Stroud GL5 2HA Stroud's prodigal son, Ted Milton with Blurt will assault the audience with their unique sludgy jazz and punk sound.Founded by poet, saxophonist and puppeteer Ted Milton in 1980 in Stroud, The compositions are based on repetitive minimalistic guitar and saxophone phrases with relentless, machine-like drum beats, over which Ted Milton orates his lyrics in a variety of voices that betray his days as a puppeteer. The overall effect is hypnotising, compelling and sometimes even unsettling. Blurt have a very strong live reputation due to the extraordinary theatrical talents of Ted Milton. The Book of Beasts are treading a new path through the outskirts of acoustic sound. A dislocated and disheveled kind of folk, where wailing laments are accompanied by mechanical noise contraptions and airbed drones, all underpinned with a shifty rhythm section. 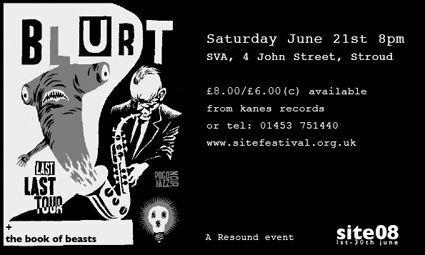 £8.00/£6.00 (c) For booking tel: 01453 751440 A Resound event.